Months ago, I was tempted to mention my attendance of the upcoming Correctional Educational Association’s Region I conference May 27-29 in Mystic, Conneck-Tea-Kit. I did not give into that temptation, because of certain correctional truisms, one of them being “Don’t Believe It ‘Til You See It.” But this week I was informed by Fiscal that, I will in fact be there, and this courtesy of the “Skill-Building Techniques for Stress Reduction” grant, now in its final Year 2 death-throes. This conference idea, BTW, was suggested two years ago by Shelley Quezada, uber-Librarian and Consultant to the Underserved on the Massachusetts Board of Library Commissioners. Shelley attends as many of our DOC librarian’s meetings as she can fit into her busy globe-trotting schedule. She also is my liaison for this grant and, in many ways, has mentored me throughout this crazyquilt career. She knows I don’t attend conferences and suggested that a good use for some of this grant money would be to get me out & about. So muchas gracias, mi buena amiga. Everyone in our Dept. approval path was enormously helpful in getting me there, and when that happens I have learned to count my blessings & wing a prayer of thanksgiving heavenward. It doesn’t always work out, this bureaucracy business. Even when it does, sometimes it does so at a cost of so many compromises that it seems pointless to have requested anything in the first place. But corrections has helped me practice gratitude, and patience. I figure another 200 years and I’ll have it down. 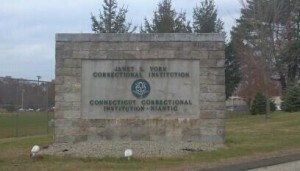 There will also be a tour of York Correctional Institution, Connecticut’s only female correctional facility. I think I’m looking forward most to that. It’s interesting, seeing how other States respond to the programming needs of inmates and the security concerns of the institution. I hope we visit their Library. I want to see how it measures up. 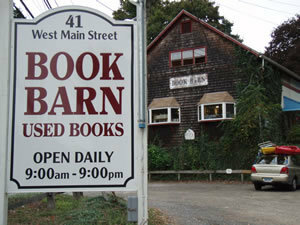 Mystic is kinda close to Niantic, a sleepy harbor that contains within its town limits one of the most jaw-dropping used bookstore empires on the East Coast, the increasingly inaccurately-named Book Barn. What started out as books in a barn has grown throughout the village–almost cancerous-like–into four separate locations, and all within a span of 1.5 measly miles. One of my favorite places to be and, since the conference is in late May, it should be one of the few times when I get to visit the place in fair weather. Take a look at their RealityTV Pilot. On Wednesday, the title pages were signed, copies made & collated, and original plus 7 were mailed at local post office before 5PM. This should guarantee that the package gets postmarked by Thursday the 11th, 5PM. That is the application deadline. I should have asked the postman to postmark it while I stood there. I didn’t think of it until now. ALSO — although I changed the budget amounts on the two budget pages, I failed to change the total grant figure on the master title page. I sent an email expressing my embarrassment and asking to be pardoned. That’s the proper thing to do in these cases. Using a telephone is another way for the Cosmos to remind you that the universe does not revolve around you. Just because an important deadline looms large, and just because every second counts. and just because you need to talk to certain key people at certain key times — Well, it don’t always work that way. Today was such a day. But things continue to move forward. For example — My application for this grant will be assigned tomorrow by someone in our Dept. for whom I hold the utmost respect, AND who is stopping by from a day-long meeting solely on my behalf. These are the kinds of people that make you proud to work in our Department. I’m with Anne: Despite everything, I believe that people are really good at heart. My name is Victor Avelino and I have participated in several ABLE MINDS classes and currently serve as the instructor’s assistant. In each class I attend, I observe the interaction between Mr. Mongelli and his students. In this environment where trust and confidentiality are key components of our everyday lives, it is difficult even for one inmate to ask another inmate to open up and share without their defenses going up. I have recognized that Mr. Mongelli has built a trust with his classes. He is able to entertain discussions on a level that the men here can relate to, without making them feel inferior, ashamed, oe even at times like a prisoner. It is easy for men in our position to shut down and keep their personal lives to themselves. However, during the classes Mr. Mongelli conducts, many of the men become invested in his conversations so that they’re able to contribute and share about their life experiences. In addition to his work as Librarian and instructor, Mr. Mongelli also lends an ear to those who need someone to talk to. Being in prison, it is hard to talk to people be they prisoner or staff. At times, the loss of a loved one is difficult to discuss, as well as depression or anger issues. Mr. Mongelli extends the courtesy of active listening to many men here, and many have taken him up o his offer. I pray this letter is helpful in your decision to award Norfolk the grant to begin a therapy course using humor. I am positive that the men here will benefit greatly by this therapeutic class. Prisoners at Norfolk respond to new programs and new program ideas, and enthusiastically support proposals and concepts that bring a fresh approach to the rehabilitative effort. Victor puts his money where his mouth is. He is a recent Boston University graduate, and has achievement certificates from several dozen programs. This effort supports how he has attempted to address the underlying causes of his criminal thinking. A further note — as I type these words, Victor has little hope of ever seeing the street again. He saw the need to change, put in the work to change, and continues to monitor his thoughts and behavior. He wanted to become a better man, and he has succeeded. To be sure, his changed attitude is based on a chance, however slim, that one day he may be released. But he knows that the change begins in jail — his crucible of changed character — for those wise enough to accept the challenge. But then they take the comic absurdity to the extreme when they sincerely tell you that they’re convinced that laughter movements such as this one will be responsible for changing the world for the better. They are zealots, and true believers. A little laughter never hurt. I myself will be opening myself up for ridicule and derision when word gets out to the staff that we’re doing laughter yoga in the Lending Library. There will be no end to it. The application’s ready to be mailed, but I remembered just last night that Shelley requires Letters of Support from our Administration. So before leaving last night I emailed them both asking for same. They have each seen and read the project proposal, due to the fact that our Department has its own program application that must be completed, reviewed, and approved before any new program ideas can be offered to the inmates. Shelley also has asked for two letters of support from inmates who have already attended my ABLE MINDS course, and who are willing to participate in “Humor-as-Therapy in the Correctional Environment.” I’ll secure those letters by Friday. The application deadline looms large…. This weekend I finished the revision to the grant application. I emailed it to Rachel Masse at the Board, who will send it onto Shelley Quezada. I asked Rachel to send me a confirmation email saying she received the application attachment. Prison paranoia runs deep. Haven’t heard from her yet. When I do, and everything’s deemed to be hokey-dokey, I then have to send seven copies of the application to the Board, who in a few months will distribute it to their SACL members for review and their selection process. Today I got a late-afternoon call from Shelley Quezada, the Consultant to the Underserved (MBLC) saying that the grant application looks good except for several minor tweaks. That was both encouraging and hopeful. After the revisions, copies must be mailed to the Board by April 11th. A part of the Humor-as-therapy in the Coorectional Environment project will be an increasingly-popular genre of stress-reduction technique called Laughter Yoga. I’ve decided to become a certified Laughter Toga Leader so I can help the prisoners enjoy the benefits of this idea. I’ve also decided to ask Laughter Yoga Teachers Bill and Linda Hamaker to come inside and lead the first Laughter Yoga sessions during the initial cycle of the project.